In current physics, particle energy and photon energy are not related through equations. This is another example of the separation of the laws of physics between the classical and quantum worlds. The equation to relate energy to mass is Einstein’s famous E=mc2 and the equation for photon energy is Planck’s E=hf. There is no method in physics to describe the energy change from particles to photons or vice versa. Although particles and photons are both measured as energy, the variables in their equations cannot be reconciled to make them equivalent. One is based on mass (m), and the other uses a variable that describes a type of wave, using frequency (f) terms. Photons are a combination of longitudinal and transverse waves that may be created or absorbed by particles. The way to reconcile particle and photon energy equations is with waves. Particles are standing waves of longitudinal energy and photons are transverse waves. Energy can be transformed from one wave form to another, but it is always conserved. Physically, the photon can be described by the vibration of a particle, creating a secondary, transverse wave that is perpendicular to the direction of vibration. An analogy to understand this interaction… imagine a balloon, under water in the middle of a pool, which is rapidly inflated and deflated repeatedly. The balloon will send spherical, longitudinal waves throughout the pool, losing energy proportional to the inverse square of the distance from the balloon. Now, imagine the balloon, while still being rapidly inflated and deflated, is also traveling up-and-down, from the bottom of the pool to the top and back again. This will create a secondary, transverse wave perpendicular to the motion – towards the sides of the pool. In molecules and atoms, temperature is a measurement of the average kinetic energy (vibration) of the atom. At absolute zero temperature (0 K), there is no vibration and no photons are created. As an atom increases temperature, it is because the atom is vibrating faster. Transverse waves are created by atoms as thermal radiation reaching photon wavelengths into the infrared or visible light spectrum. The focus and calculations of photons in this web site is based on the interaction with the electron, as it creates and absorbs photons and transfers longitudinal wave energy to transverse wave energy and vice versa. In the case of an electron in an atom, the vibration is short-lived. Thus, these photons are short-lived packets of transverse wave energy. A photon does not have mass like a particle. Mass is defined in energy wave theory as stored energy from standing waves without consideration of wave speed. A photon is a traveling wave without any wave centers. Thus it is a packet of energy but it does not have mass. A photon may be absorbed by a particle, such as the electron, transferring energy from transverse wave form to longitudinal wave form. The interaction occurs not with the particle’s standing waves, but instead it is the interaction with wave centers at the particle’s core. A detailed view of the photon as moving aether granules and an electron with wave centers at the core of the particle is illustrated below. 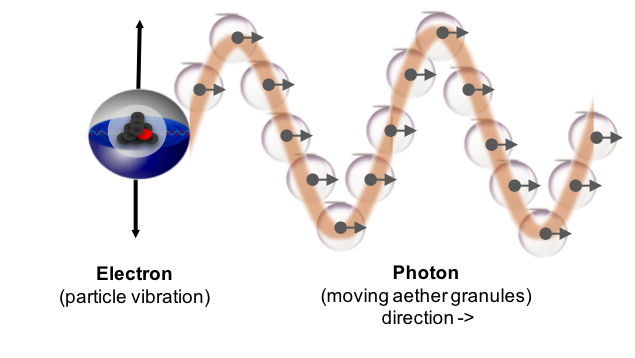 An electron’s wave center (shown as a red dot below) is constantly spinning, affected by longitudinal waves and positioning to be at a standing wave node. In the atom, it is now also affected by the spin of the proton in the nucleus. The electron’s spin was covered in the electron page. A photon must match the right frequency to be absorbed by a particle because it is the interaction of the photon’s components (granules) with the core of the electron (wave centers) that are spinning. It must match the resonant frequency. Resonance is often described like an adult pushing a kid on a swing. Push at the wrong frequency and the adult misses the kid or it takes significant energy. Pushing at a frequency that matches the frequency of the swing results in the greatest amplitude (height) with the least amount of energy spent. This concept is applied to the detail of a photon interacting with an electron. When a photon is absorbed, it transfers transverse wave energy to longitudinal energy as a result of the electron’s spin. Increasing electron spin – even if temporary – causes an increase in longitudinal wave amplitude between the electron and the atomic nucleus. It is constructive wave interference to the repelling force that causes the electron to stay in orbit, as explained in the section on atomic orbitals. The increased amplitude forces the electron away from the nucleus as it moves to minimize amplitude (the fundamental rule of motion – Law #4 of the Theory Laws). With sufficient energy, an electron will be ionized and leave the atom. When energy is not sufficient to overcome the binding energy with the nucleus, the electron moves away to the point of minimal wave amplitude (orbital), as a result of the electron spinning at the frequencies, but will eventually return to its initial position. All energy is waves, but it comes in different forms: longitudinal and transverse. Furthermore, the motion of these waves may be traveling or standing. However, a fundamental rule in physics is the conservation of energy. There are various scenarios of photon interactions with electrons. This section describes the process for each of these scenarios. A summary is provided first and then each scenario is described in detail to compare it to experimental observations. The diagrams assume a knowledge of the components for aether wave motion (granules) and particle formation (wave centers), and how they interact, as shown on the photons page. They key to understanding the next section is resonance frequency as it relates to the electron’s spin. 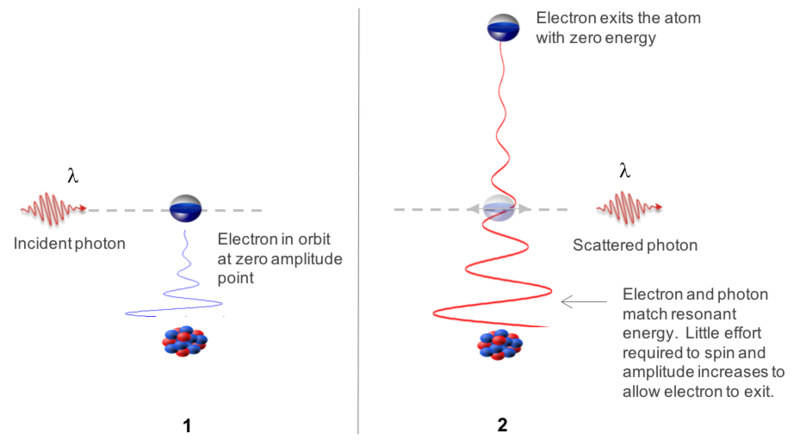 In spontaneous emission experiments, an electron moves to an orbital closer to the atomic nucleus, generating a photon. This may occur for an electron that drops from a higher-level orbital or it may also occur for an electron that is outside of the atom and is captured into an orbital. An electron in a higher orbital or outside of the electron will be attracted to and move to the orbital where the sum of forces is zero. Before stopping, it will vibrate and produce two photons. The vibration converts longitudinal wave energy to transverse energy. It vibrates perpendicular to the direction between the electron and the nucleus as it reaches the orbital and begins to spin synchronous to the proton. The temporary vibration of the electron as it settles into position creates two transverse waves traveling in opposite directions. One travels away from the nucleus and is measured in experiments. The other photon travels to the proton and is absorbed by the massive nucleus as the recoil energy. In stimulated emission, an electron is first excited to a higher level. While excited, a second photon is used to excite the electron further. In experiments, this results in two photons being generated that leave the atom. The two photons will be identical in energy, spin and polarization. Starting with #1 (figure below), an already-excited electron is struck by a photon. This excites the electron momentarily and then it returns to the excited orbital, which still temporarily has increased amplitude. Upon reaching this orbital, where the sum of forces is temporarily zero, it vibrates and creates two photons traveling in opposite directions. Similar to spontaneous emission, one photon will leave the atom and one will reach and be absorbed by the nucleus as recoil. Finally, the temporary increased amplitude between the electron and nucleus disappears. Once it disappears, the electron is attracted again to the nucleus and moves to the ground state where amplitude is minimized (sum of forces is again zero). Upon reaching this point, it vibrates again, generating two photons. One will leave the atom and one will reach the nucleus and be absorbed as recoil. 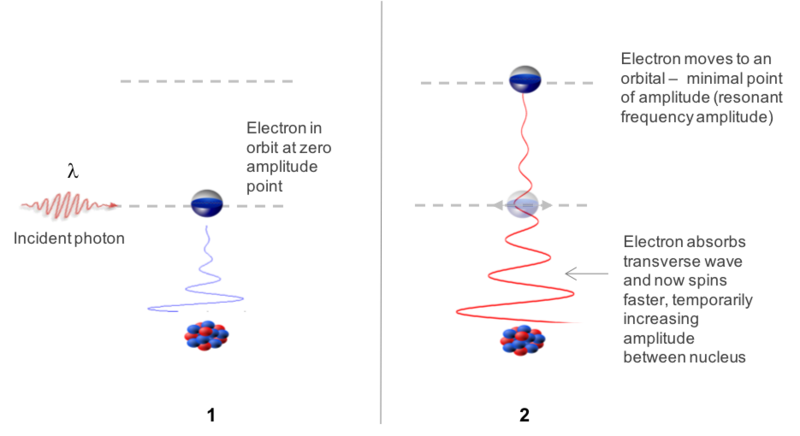 The two photons from #2 and #3 that leave the atom travel in the same direction and have the same spin and polarization since they originate from the same electron. An electron and a positron are known to annihilate in experiments, seemingly disappear and produce two photons (gamma rays) traveling in opposite directions. 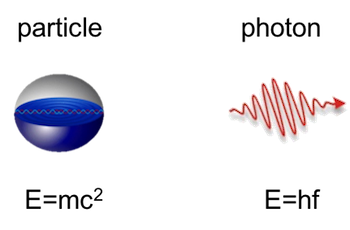 Similar to the proton, the electron is attracted to the positron due to destructive wave interference that causes particles to be attractive to minimize wave amplitude. Unlike the proton, it is only attractive. 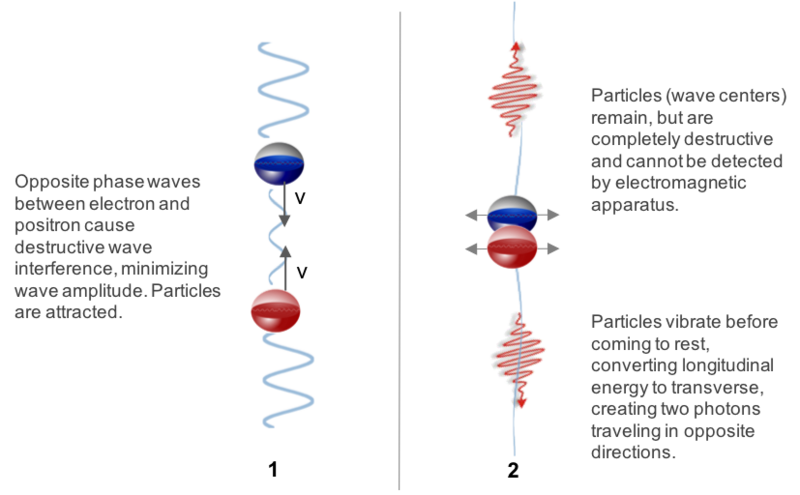 There is no repelling force to create an orbital so the electron and positron will be attracted until the particles meet – destructive wave interference affects the standing wave structure too. Before coming to rest, both particles transfer longitudinal energy to transverse, vibrating perpendicular to the direction between the particles. Photons may pass through an atom and maintain the same energy and direction, even if it appears to coincide with the electron’s path. In this case, the photon is not absorbed by the electron. As illustrated in the photons page, the photon should match the frequency of the electron to exchange energy. In the example of the swing, the adult could miss the chance to push the kid if the frequency does not match, similar to the photon’s granule missing the chance to push the electron’s wave center. This results in the photon passing through the atom unless it matches a resonating frequency. A photon may be absorbed by an electron and change to a higher energy level orbital, which is further from the nucleus. Unlike spontaneous emission, which is when an electron moves closer to the nucleus and emits a photon, to move an electron further from the nucleus requires the absorption of a photon. However, there are defined orbitals that are possible, resulting in quantum jumps. The next figure explains the process. An incident photon strikes an electron which is at a lower energy level orbital. In this case, the photon frequency matches the electron’s spin frequency of the wave centers, causing a temporarily faster spin. This transfer of transverse energy to longitudinal energy increases the wave amplitude between the electron and the nucleus, forcing the electron away to the new point of minimal amplitude – a new orbital. The photon must match (resonate) with the spin of the photon for this to occur, but there are multiple frequencies that allow the collision of the photon with the wave centers in the electron. With more energy in the photon, at the correct frequency, the electron spins faster, creating more wave amplitude. These photon frequencies convert transverse energy to longitudinal energy, causing distinct repelling wave amplitudes and thus different orbitals. 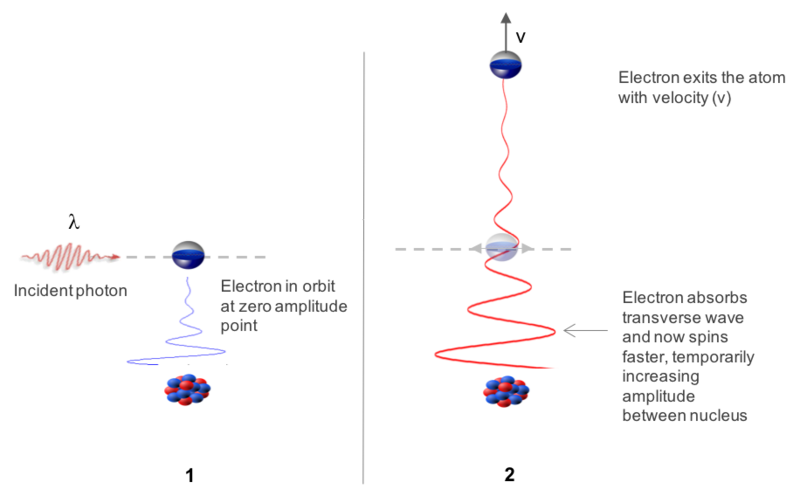 As photon energies get larger (compared to orbital transitions from the previous section) it can cause the electron to escape the atom. Photon energy that exceeds the binding energy is converted to kinetic energy when the electron leaves the atom – a faster velocity. The next figure explains the process for the photoelectric effect. Similar to the absorption of the photon in the previous scenario for orbitals, transverse energy is converted to longitudinal energy, temporarily increasing wave amplitude between the electron and nucleus. This time, the energy that repels the electron exceeds the attractive, binding energy. The electron will escape the atom. Due to the conservation of energy, any additional energy from the repelling force is converted to kinetic energy – ½ mv2, where m is the mass of the electron and v is the exit velocity. The next figure shows photons that strike the electron not only eject the electron from the atom, but now also produce a photon that leaves the atom, which may leave at a different angle than the incident photon. This is referred to as the Compton scattering effect. In Compton scattering experiments, the angle and energy of the incident photon is compared to the angle and energy of the new, scattered photon. Using the swing example, imagine a wind that blows in the same direction as the man, also blowing at a given frequency. When the man pushes at the same frequency as the wind, he is aided by it, increasing amplitude with no effort. In an atom with two or more electrons, there would be the equivalent of one or more “winds” that are repelling the electron struck by the photon. The photon is aided by these electrons. A lot of the photon’s energy does not need to be absorbed, and therefore some of the energy, if not all, can continue. Note: Angles of the electron and scattered photon are dependent on the angle and energy of the incident photon. This is described in more detail with various scenarios in the Photons paper. An electron and a positron are known to appear in space, where they did not previously exist, after a high-energy photon (gamma ray) disappears. This process is known as pair production. This process may also occur when a gamma ray strikes the nucleus of an atom. From the annihilation section (above), a combination of a positron and electron produces destructive waves that collapse the standing wave structure of both particles. The particles have no mass and are not detected by electromagnetic apparatus but the wave centers remain. When a gamma ray strikes these wave centers, they will increase amplitude, causing separation of the particles just like the process in which an electron leaves the atom. In this case, there is not a large nucleus mass to absorb a recoil and so the positron also exits, in the opposite direction of the electron. Once separated, the wave centers continue to reflect longitudinal waves. The reflected out-waves now combine again with in-waves to form the standing wave structure of the particles. Mass has been recreated by this effect of separating the two particles’ wave centers. The same process occurs in an atomic nucleus. The neutron is a composite particle that contains a positron and an electron in its center. This is also the reason for electron capture that converts a proton (which has a positron in its center) to a neutron. It also matches beta decay experiments. 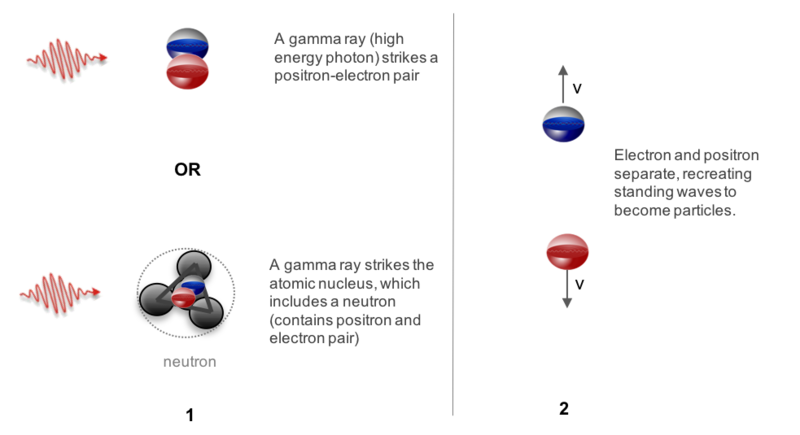 With this structure of the neutron, a gamma ray hitting the positron-electron combination would have the same effect of pair production – forcing an electron and a positron from the nucleus. The neutron in the nucleus would still be neutral but it would now be an empty shell of a nucleon.